Dr. Michael Aaronson has been featured as one of the New Faces at Bryan. He is being welcomed along with a group of physician colleagues to the Bryan medical community. An online version of Journeys Magazine (Spring, 2019, page 18) is available here. 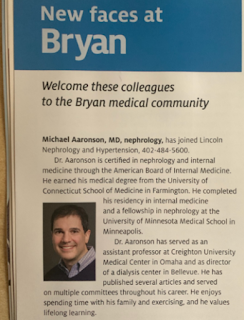 Michael Aaronson, MD, nephrology has joined Lincoln Nephrology and Hypertension, 402-484-5600. Dr. Aaronson is certified in nephrology and internal medicine through the American Board of Internal Medicine. He earned his medical degree from the University of Connecticut School of Medicine in Farmington. He completed his residency in internal medicine and a fellowship in nephrology at the University of Minnesota Medical School in Minneapolis. 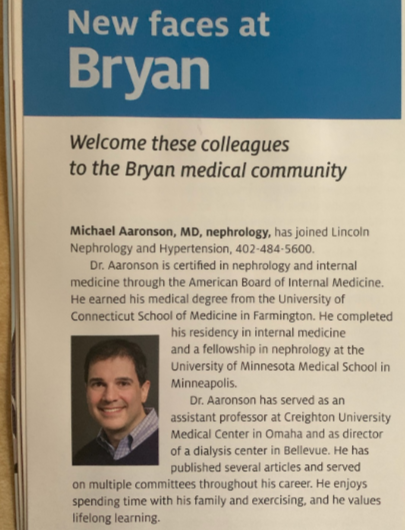 Dr. Aaronson has served as an assistant professor at Creighton University Medical Center in Omaha and as director of a dialysis center in Bellevue. He has published several articles and served on multiple committees through his career. He enjoys spending time with his family and exercising, and he values lifelong learning.